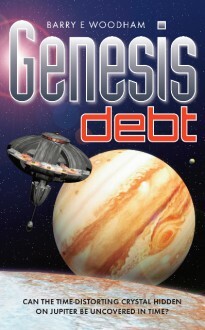 Genesis Debt is a sequel to Genesis 2. Long after the sun has entered its red giant stage, the human race is recreated by nannite Guardians on a Jupiter that has had its great gas mantle stripped away. Instead of a gas giant the nannite crew find a seeded world teaming with life on a super continent that stretches from pole to pole. Several years after the defeat of the Tyrant, Ender-whann-soo’s Brood-mother daughters devise a way to reach out to the people of Earth six million years into the past. In doing so, the riddle of the Gnathe’s existence on Jupiter will at last be explained and the possibility of saving the human and ape civilisation from the danger of the expanding sun become a reality. To do this will mean using the airship again to find a large time-distorting crystal that was once hidden under Jupiters Red Spot. The resurrection of the deposed Empress can lead to an alternative reality that could create a paradox in time. The blood debt of the Gnathe will be paid in full or Link-soo-shan’s revenge will destroy them all. ‘The Genesis Debt’ will be paid by the Gnathe.